Spain's Nani Roma in his BMW en route to victory in stage one of the Dakar 2010 between Colon and Cordoba. (CNN) -- Spanish driver Nani Roma upstaged the pre-race favorites to set the early pace at the Dakar Rally in Argentina on Saturday. Roma, who was 10th overall last year after being hit with a late time penalty, was the leading car driver in the first stage from Colon to Cordoba. The 37-year-old, who won the motorbike class in 2004, was two minutes and seven seconds ahead of compatriot and two-time world rally champion Carlos Sainz in a Volkswagen. Roma's BMW team-mate Stephane Peterhansel, a total nine-time winner of the endurance event in the car and bikes categories, was a further 43 seconds adrift following the 199-kilometer stage. 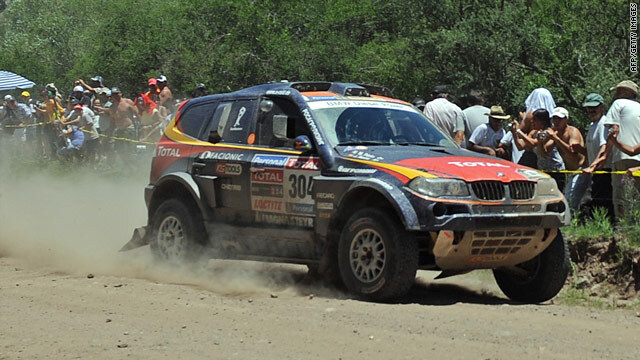 Defending car champion Giniel De Villiers was four minutes and 31 seconds adrift in a Volkswagen in fifth, behind teammate Nasser Al-Attiyah of Qatar, while NASCAR racer Robby Gordon was sixth in a Hummer. "In the end we were quite surprised by the time we achieved," Roma told the race's official Web site. "But I'm happy. We had a fright with the engine in the middle of the special stage and had to stop to make a few checks. But everything was running okay. I think it was an electrical problem, but since it was working, I preferred not to interfere with anything. "It's only just the start. We haven't really had a battle with the VWs yet. There is still a lot of the race to go. In any case, it was a good special stage for warming up." David Casteu also upset the favorites as he led the motorbike class by a small three-second margin from fellow Frenchman Cyril Despres, with defending champion Marc Coma 12 seconds back. Riding a 450cc machine in comparison to his rivals' 690cc KTM bikes, Casteu won a stage in the race for just the second time. "I was riding at 150 kmph, but the bike held stable and is coping well. I hardly used any petrol. In fact, I had three times too much," he said. Poland's Rafal Sonik headed in the quad class, with fellow Yamaha rider Marcos Patronelli trailing him by one minute and 55 seconds. Russia's Vladimir Chagin led the truck category by 27 seconds from Ales Loprais of the Czech Republic. The 14-stage race finishes in the province of Buenos Aires on January 16, having also traveled into neighboring Chile. The event was staged in Africa and Europe until last year, having been canceled in 2008 due to security concerns.